HydroSource Associates, Inc. (HSA) focuses on the exploration, development, and management of groundwater resources. 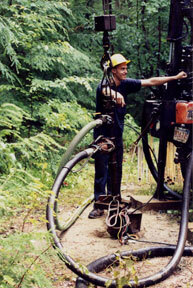 HSA's earth scientists have pioneered the process of exploration and development of high-yielding water wells in fractured crystalline bedrock and have significantly improved the traditional methods of exploration for the siting of wells in karst (limestone), complex volcanic geologic settings, and alluvial (sand and gravel) environments. HSA locates and develops potable water, irrigation-quality water, brackish water, and seawater intakes (the latter through land-based bedrock fractures). HSA has capabilities in riverbank filtration (RBF), angled well drilling, and aquifer storage and recovery (ASR). Since its inception, HSA has continually broadened its capabilities, advanced its technology, and successfully applied its groundwater exploration program over a highly diverse spectrum of geologic and geographic settings. HSA scientists have worked throughout the United States and in the Caribbean, South America, China, Southern Africa, the Horn of Africa, and the Middle East. HSA has an outstanding track record of success, having developed tens of millions of gallons per day of groundwater supplies for its clients. HSA's use of geophysical instruments and methods includes seismic, electrical resistivity, ground penetrating radar, electromagnetic, magnetic, gravimetric, self-potential, and magnetotelluric. HSA's well development and well rehabilitation methods include surge, water jetting, chemical injection, and hydrofracturing. HSA has conducted hundreds of aquifer pumping tests on nearly every type of water supply well and aquifer to provide HSA hydrologists and water resource management specialists the information to create a Water Management Plan for its clients. The Water Management Plan ensures that the client receives the maximum benefit from the new water supply, without over-pumping or causing negative impacts to the aquifers or surrounding environment, ensuring that the water system will operate properly and provide water for decades to come. The Water Management Plan also provides the information needed to obtain required approvals from regulatory agencies.